Xigera Safari Camp takes a maximum of 20 guests in rustic but comfortably furnished tented rooms. Built within a shady grove, Xigera consists of 10 luxuriously furnished walk-in tented rooms, with en-suite facilities and outdoor shower. Each room of this Botswana accommodation is raised off the ground offering superb views of the floodplain to the east of Xigera Camp and its attractive waterhole. Each guest's room has a great view directly onto this floodplain. The wooden footbridge, a unique feature to Xigera, connects the Xigera island to the next and is often used by Lion and Leopard moving between the islands, allowing guests great viewing opportunities. The safari tents have en-suite bathrooms and fans, and supplied with soaps, shampoos and insect repellents. 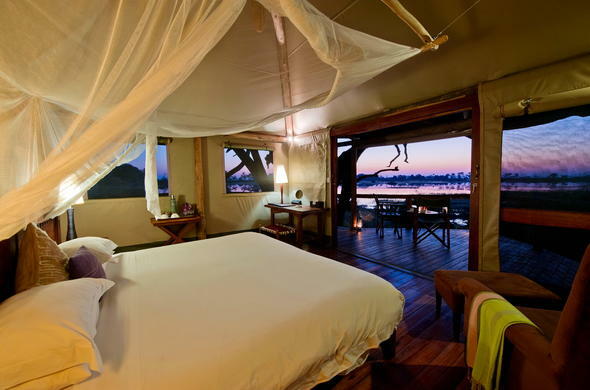 Xigera Camp can accommodate 20 guests in safari tents raised off the ground on wooden walkways. Each guest's room has a great view directly onto a floodplain.